My sister and I made fourteen Valentine's Day cards/gifts for our other sister and mailed one to her each day. It was really fun researching and planning and we both came up with some great ideas. I also loved it because it gave me some awesome ideas for my own family, such as an invisible letter, matchbox notes, mini banner, jar of hearts... etc. 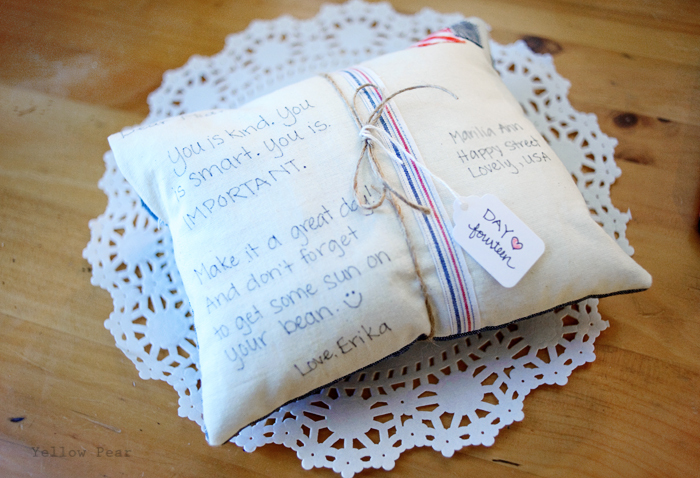 For Day 14, I made her a postcard pillow with fabric stamps and wrote some happy thoughts...specifically ones that are meaningful to us personally, ie references to favorite books and favorite quotes. I used a permanent marker for the words and penciled on some light lines ahead of time to keep them straight. I also sewed a striped fabric strip to separate the postcard sides. I thought this would be such a great idea for a birthday, get well wishes or missing someone far away. It was so simple to make. I just gathered up some suitable fabric from my stash and cut out two rectangles for the front and back. Next I sewed two stamps onto the front with a zig-zag stitch and a strip of striped fabric to separate the sides (with a straight stitch on either side...ribbon would work too). Then, I wrote my message and address. And finally I sewed the whole thing together, stuffed it and hand-stitched the opening.